Classic RTM frame construction, ideal road bike geometry, and made in France? Have it all with the TIME Alpe d'Huez 21 Ultegra road bike. The Alpe d’Huez hill climb is among the most famous climbs in cycling history. It’s 21 hairpins offer a different, yet similarly beautiful view of the mountain range, a reward for the climb that lies ahead. TIME Sport’s newest model, the TIME Alpe d’Huez 21 Ultegra road bike, commemorates the fearsome climb with an all-new carbon road bike frameset that sets the standard in build quality and ride performance. TIME has two models of the Alpe d’Huez: the Alpe d’Huez 01 and 21. The Alpe d’Huez 21 is built just as any other TIME bicycle through their Resin Transfer Moulding (RTM) design, which consists of injecting resin under pressure into a mold to obtain a solid homogeneous structure of the future frame. They use over 6200 fibers in making the Alpe d’Huez 21; not as much as the 7300 of the 01, but much more than what other companies use. Rather than the more expensive and lighter Vectran, the 21s incorporate seven percent basalt in its carbon layup. It still takes 22 hours to build a frameset, a testament to TIME’s dedication to build quality. The TIME Alpe d’Huez 21 weighs just 90g more at 930g for a frame and hardware, lighter than both the TIME Scylon and TIME Fluidity. This makes it lighter still than the outgoing TIME Izon road bike. Other differences include a conventional metal seatpost clamp that sits flush with the top tube (instead of an integrated one), a slightly different seatstay junction, a standard Quickseat headset, and a lack of a Aktiv fork option. While not as stiff as it’s pricier sibling, the Alpe d’Huez 21 still offers plenty of stiffness out of the saddle while still riding like a proper climber’s bike. TIME Alpe d’Huez 21 Ultegra features a Shimano Ultegra R8000 mechanical drivetrain and Mavic Ksyrium wheels as an excellent baseline. A Deda RSX 02 seatpost, Deda Zero 2 stem, Deda RHM 02 handlebars, and a Fizik Arione VS saddle complete the largely French package. Alpe d’Huez 21 Ultegra road bike in six sizes (XXS to XL) and in a bevy of color options to fit your needs, as well as TIME’s custom color program. 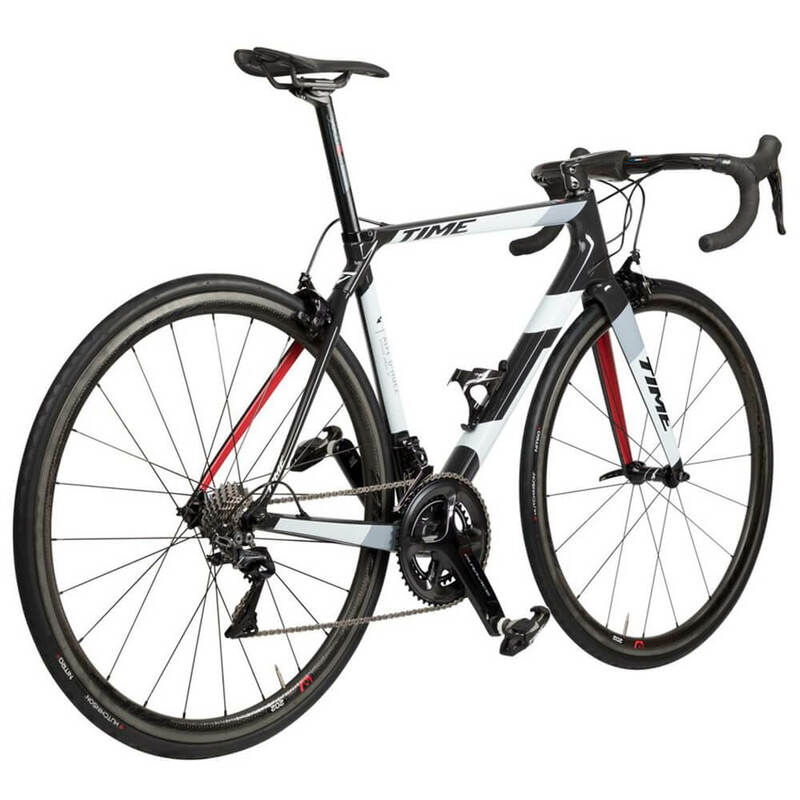 Want a TIME Alpe d’Huez 21 Ultegra road bike or a complete bike for yourself? Give us a call during shop hours, or send an email to info@contenderbicycles.com to discuss options.